Although I definitely prefer Estes Marine Sand as the substrate for almost any tank, there are circumstances where people will want to use gravel. For one there are some fish that are just too big to use sand. Monster fish like pacus, huge catfish, large cichlids, and African cichlids that decide it’s fun to spit the sand directly in to the filter intake, etc. may require you to use gravel because otherwise them moving around can be enough to kick up sand to the point of it being pulled in to the filter and doing damage to the pump. Another issue may be color. The sand simply doesn’t come in brown. They do have a beige, but this is better called ‘natural’ and is barely off white. It doesn’t have that bright white look, but if I had it in a tank and told you it was white you probably wouldn’t think twice. I actually reached out to Estes about doing a brown sand and they said they would share the idea, but we will see if anything happens. 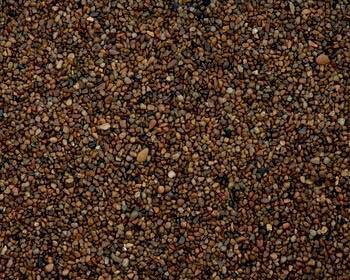 Some people may simply not like the look of Estes Marine Sand so badly that the benefits aren’t worth it to them and they don’t mind vacuuming gravel. Whatever the reason, if you decide to do gravel I highly suggest using Estes Bits of Walnut (aka Bits o Walnut). Be aware that they did discontinue it for a period of time but have since brought it back (for a few years now). Because of this if you ask for it at an LFS they may think they can’t get it in for you. The color is a nice, natural looking, dark brown. This is a great look for any tank and this is the reason they should make a sand the same color. The size is really good for a gravel. It is still course enough to trap debris and require being vacuumed, but because it is smaller it won’t trap as much. Depending on the fish it would be a lot less likely to cause issues such as getting stuck in mouths, throats, or causing impaction. I can’t imagine that even the most determined cichlid could manage to get this in to a filter. It is a gravel, so it does add the maintenance of vacuuming. It could also trap small sinking pellets (1mm or so). Although I am not a fan of gravel in general, if it is going to be used this is an exceptionally great choice and the only thing I would consider.